Greens Removals and Storage Ltd have been helping people to move home or office since 1970, and our experience and reputation have helped us become one of East Anglia’s largest and best known privately-owned worldwide domestic and commercial removal companies in the UK. Our commitment to high standards and customer service is demonstrated by Greens Removals and Storage being the only company in East Anglia, and one of only a handful of companies nationally to have achieved all three of the British and European Quality Service Standards relevant to the removals industry. Maintaining this certification involves evaluation and annual surveillance by QSS (Quality Assured Services Standards Ltd). These standards are the first and only recognised quality standards specifically aimed at the Removals Industry. Certified companies operate to clearly defined standards and the procedures are designed to benefit you, the customer, at every stage of your move. Greens Removals is a member of the British Association of Removers (Membership Number GO57). The British Association of Removers was formed in 1900 and today represents leading removals and storage companies throughout Great Britain and the rest of Europe. Members are inspected to ensure that they are operationally and financially sound and must also follow good practice guidelines. They demand a high level of performance from all members offering removal services and monitor this on a continuous basis. The sign of a BAR badge indicates commitment to customer service. Local removals are a primary feature of our business. Many of our domestic removals customers are based across East Anglia and we use our well developed knowledge of the area to ensure that all our quotes are tailored to meet the customers needs, and provide the most efficient service available. We also move customers all over the UK. Our international removals service takes the stress out of moving abroad We’ve adapted to meet today’s exacting standards in the international removals and secure storage industry; moving thousands of satisfied home owners and businesses to destinations all over the world every year. We have successful and well established partnerships with shipping agents and relocation companies in many of the popular destinations to ensure that customers benefit from a ‘local’ service even after they leave the UK. It’s essential to work with suppliers who share our values and principles. Our partnerships with reputable shipping lines, and international removal delivery agents allow us to provide a shipping service to nearly every country that has a port. Greens Removals are members of The British Association of Removers (BAR) specialist overseas division called the BAR Overseas Group. The BAR Overseas Group created the IMMI (International Movers Mutual Insurance) Advance Payment Scheme in order to protect customers who pay for their International Removal in advance. When you undertake an international removal, you will be required by international removals companies to pay in advance or at least to pay a deposit prior to the shipment leaving the UK. International removal companies that are bonded by the BAR Advance Payment Guarantee, like Greens Removals, offer protection for your pre-payment. In the unlikely event that your international mover or their agent will not be able to carry out your agreed move, or if it ceases trading for example, you will be financially covered and will still be able to receive your household effects at your destination. The BAR Overseas Group will appoint another BAR Overseas Group member and agent to complete the move. The scheme is similar to the ATOL scheme for holidays. It is a guarantee that whatever happens, you will receive the service that you have already paid for. Greens Removals are long-standing members of the BAR Overseas Group and part of the BAR IMMI Advance Payment Guarantee Scheme. It is another mark of quality that you can expect from Greens International Removal Service. Whether you are moving down the road or across the world, Greens Removals take the logistical nightmare out of moving. Our team have a wealth of experience with domestic removals, international removals, logistics, regulation, customs restrictions and documentation. We boast specialised removal vehicles and lifting equipment, packaging and storage facilities that leave nothing to chance and staff who have been specially trained to make moving home as straight forward as possible. Moving house is ranked as one of the most stressful experiences so it surely makes sense to use an experienced remover with certified credentials to ensure peace of mind and benefit from our personal and caring removals service. 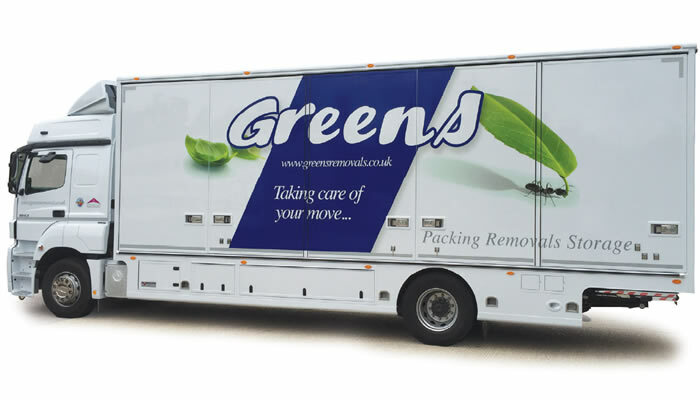 Greens have a long tradition in removals by road to mainland Europe. We move customers’ goods across Europe with our own removal vehicles and crews, whether as a part-load (with other consignees) or dedicated service (entire contents on their own designated vehicle). Through our network of overseas moving partners, we offer regular full and part load services to and from mainland Europe. We offer direct removal services to France, as well as removals to Germany and removals to The Netherlands and Belgium. A specialist removal service to Switzerland and Norway is provided that covers all import documentation and customs export and import formalities. We also cover many other Eastern European countries as required, including removals to Croatia Maldova, Albania,Turkey, as well as removals to emerging countries like Bulgaria and the Czech Republic. Green’s removals and storage are able to offer a range of insurance option including fully comprehensive insurance to our customers moving overseas or within the UK - meaning your goods and personal effects will be covered for the duration of the move, from start to finish. Greens have two secure purpose-built furniture and personal effects containerised storage warehouse facilities, incorporating the latest fire and security systems. Our secure storage service is geared to those requiring a totally flexible storage solution.